The Zinn Life: Pioneer Woman Cheesy Sausage Rigatoni in the Crock Pot! Real talk - I love the Pioneer Woman. I love her a whole lot. Like want to travel to Pawhuska, OK and visit her store. She's kinda my hero. And while I love her, I don't always have time for her recipes. I am not one to make up my own recipes from scratch, but I am one to take someone else's recipe and change it up! 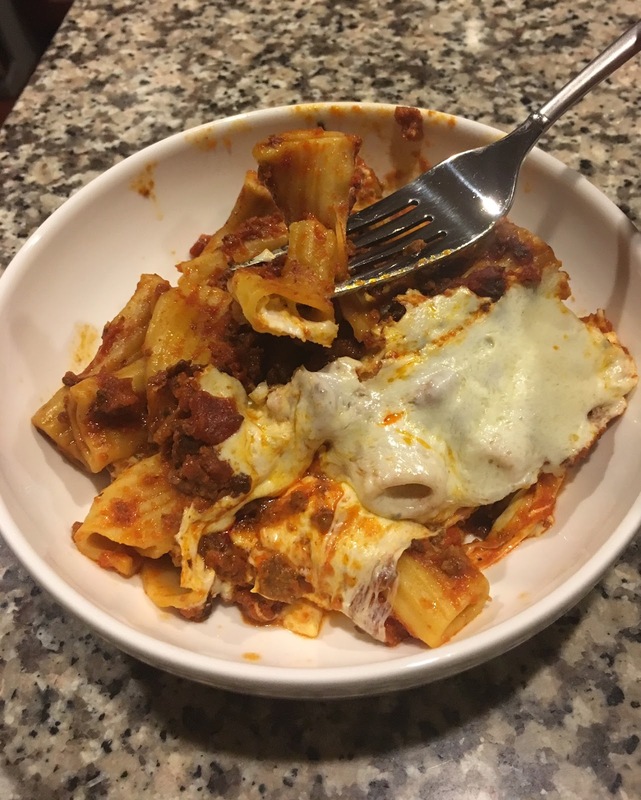 Today we're going to talk about how to make the Pioneer Woman's Cheesy Sausage Rigatoni recipe...in the crock pot! Tuesday nights in the Zinn household are crock pot nights. This is usually my night for two classes, which means I'm getting home around 7:45 to 8:00 PM. That's pretty late to start cooking. In comes the crock pot! I set everything up for the crock pot meals Monday night, turn it on Tuesday morning and then come home and eat some dinner before heading to class. It sounds great, and generally is, but there are only so many times you can eat stew beef, pot roasts and the like. 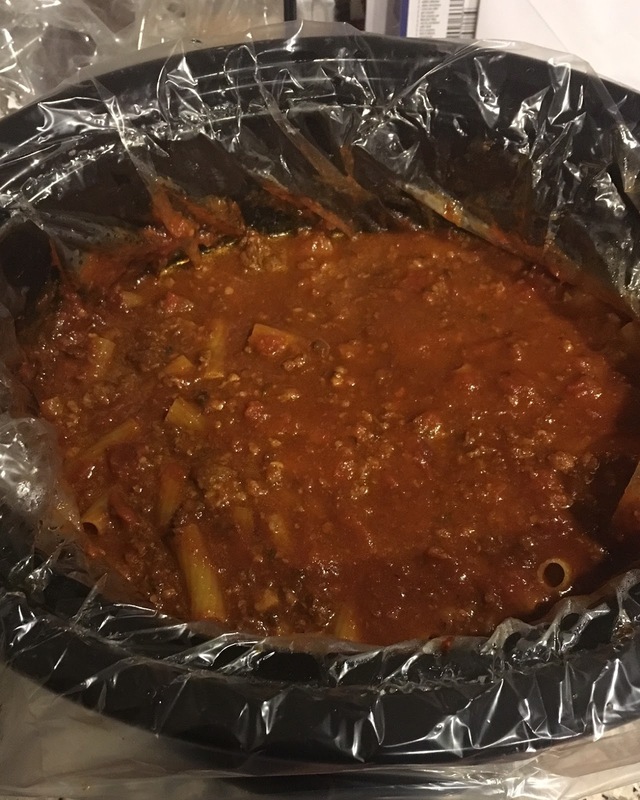 I've had to get pretty creative with all of my crock pot meals, which is how this one came to be! I present to you PW's Cheesy Sausage Rigatoni in the Crock Pot! The original recipe can be found here on Food Network. First off - I nixed the finely diced onion and used onion powder. Cause I'm lazy like that. Second - I replaced the Italian sausage with chorizo. If you haven't discovered chorizo, you, my friend, are severely missing out. However, if you're making this for your family and your kiddos (or you) don't like spicy foods, I would stick with Italian sausage. If you're like us and like a little kick, chorizo all the way! I browned 1 lb chorizo and then combined the chorizo, 2 25-oz jars of marinara sauce, about 1/2 cup of red wine (because it was on the counter and it felt right) into the crock pot. I added some onion powder and garlic powder. I didn't even measure it, just sprinkled a good amount on (probably about a tablespoon of each). I mixed it all together and then put it on Low for 7 hours. A note - My crock pot automatically switches from Low to Keep Warm when it's done and it sits on Keep Warm until I come home, about 3 hours, so I adjust the time it actually cooks to keep from drying out the meat/sauce. I would say ideally, to do this on Low for 8 hours if it isn't going to sit on keep warm for a while. 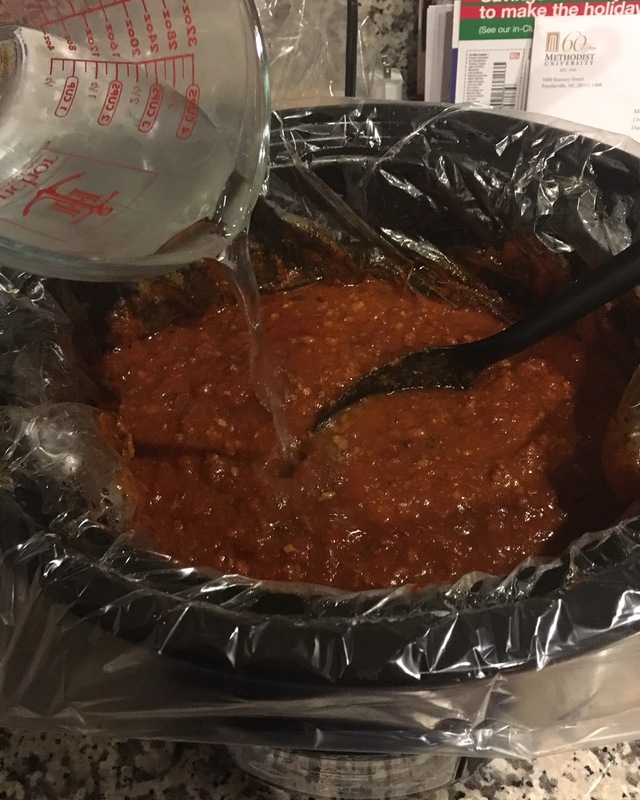 When you get home or the time is up, add a cup of water to the sauce. You'll need the additional liquid for the noodles. Add in 1 lb. 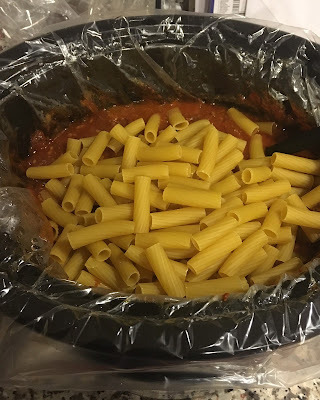 of rigatoni. You'll think that all the noodles won't be covered by the sauce, but they will. Mix to where the noodles are covered by the sauce, turn on to High and cook for 1 hour. The first time we did this, we did 30 minutes and it wasn't enough. You need that full hour for the noodles to cook all the way. Make sure all the noodles are covered with sauce. At the very end, when the noodles are pretty much ready, cube two 8-oz balls of mozzarella and mix them into the sauce. They don't have to stay in long, just long enough that the cheese starts melting. About 10 minutes. If you're better than I am and keep it around, chop up some parsley, throw it on top and serve it! I don't keep it in the house, so I just ate it as is. The noodles soak up all the extra liquid and you're left with this really nice, thick sauce that sticks to the noodles and big chunks of melty mozzarella. It's become one of our favorite meals, not only because it's so tasty, but also because it's so easy! The best part is that most of the time I start this and Aaron finishes it for me while I'm in class. If you ever need a change up in your crock pot meals, try this! You won't be sorry!